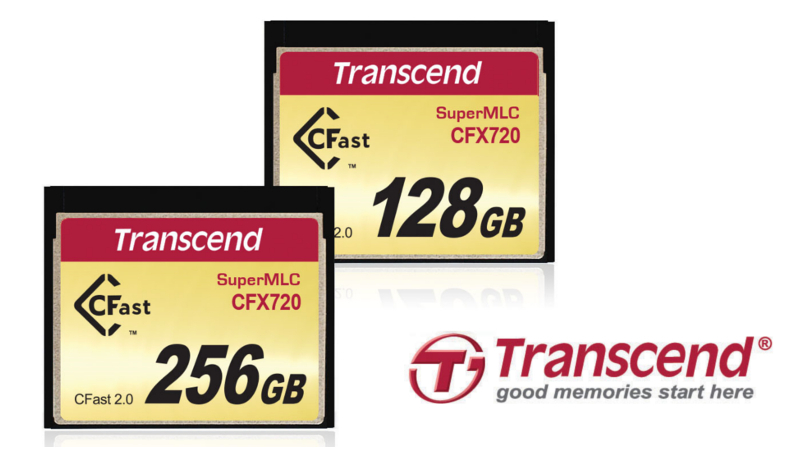 Transcend launched the industrial-grade SuperMLC CFast 2.0 CFX720 memory cards, with transfer speeds of up to up to 500MB/s. When it comes to consumer electronics, SD cards are the most common kind of mass storage device thanks to its relatively low cost and high storage capacity compared to other memory card types. But when it comes to industrial-grade usage, typical SD cards have reliability, but tend to lack in speed. For more demanding uses, memory cards such as the new Transcend SuperMLC CFast 2.0 CFX720 are a better fit. Transcend Information, Inc., is proud to announce the launch of its industrial-grade SuperMLC CFast 2.0 CFX720 memory cards. Positioned between its SLC and MLC NAND flash offerings, Transcend’s exclusive SuperMLC technology features a cost-effective solution that offers performance close to that of SLC NAND flash. Compliant with the latest CFast 2.0 specifications, the CFX720 memory cards boast high-performance and exceptional endurance at affordable prices, especially ideal for demanding industrial grade applications such as handheld embedded systems, test and measurement instrumentation, surveillance recording systems, and inventory control devices. Combining the benefits of both Single-Level Cell (SLC) and Multi-Level Cell (MLC) NAND flash, Transcend has successfully developed SuperMLC technology by reprogramming the two bits per cell of MLC into one bit per cell, greatly boosting its performance. Compliant with the latest CFast 2.0 specifications based on the SATA III 6Gb/s interface, the transfer speed of Transcend’s CFX720 memory cards can reach up to 500MB/s, double the speed of MLC flash chips. Transcend’s SuperMLC technology offers a good balance for industrial applications that demand quality that is comparable to SLC NAND flash at a cost-effective price. Transcend’s CFX720 memory cards are fault-tolerant and offer exceptional endurance, delivering up to 30,000 P/E cycles*, ten times more durable than MLC NAND flash. In addition, built-in advanced Error Correcting Code (ECC) and S.M.A.R.T. functions ensure reliable data transfer and provide self-monitoring capabilities that offer optimum data protection. Other value-added technologies such as device sleep mode, security command, and a global wear-leveling algorithm provide optimal reliability and stability. Transcend’s CFX720 memory card has capacities ranging from 8GB to 256GB. The cards are backed by Transcend’s Two-year Limited Warranty.